The rich hoard technology and medicine. The middle class sells its soul for a chance at a better life. Everyone else is treated as Waste. 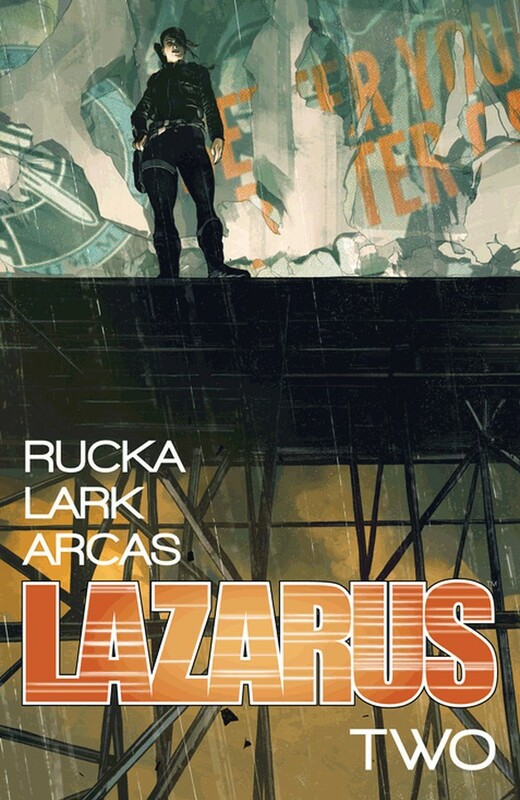 All of the above can be observed looking outside a window in 2019, or readers can find a heightened—but frighteningly plausible—version of that reality in writer Greg Rucka and artist Michael Lark’s ongoing series Lazarus, which might be the most prescient comic of our bleak times. 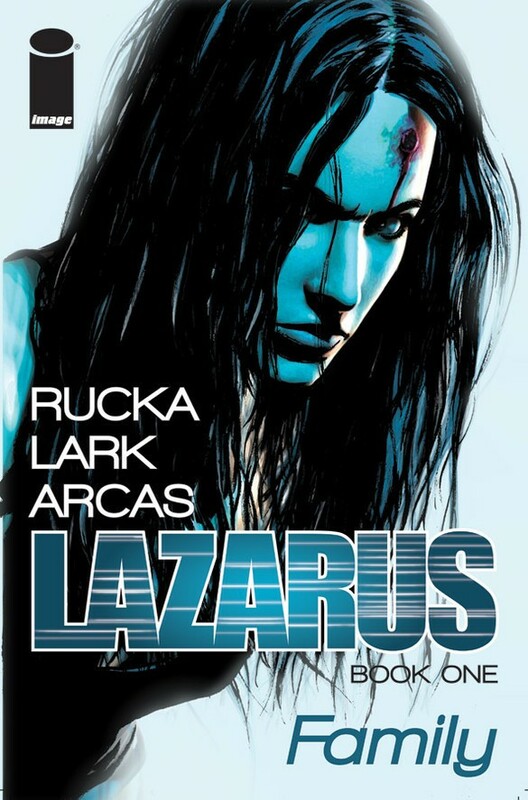 The first issue of Lazarus: Risen, out today, brings a new chapter in Rucka and Lark’s acclaimed dystopian epic, now releasing on a quarterly schedule with a 64-page format, including bonus stories from Lilah Sturges and supplemental material on the Modern Age: World of Lazarus Roleplaying Game by Green Ronin. 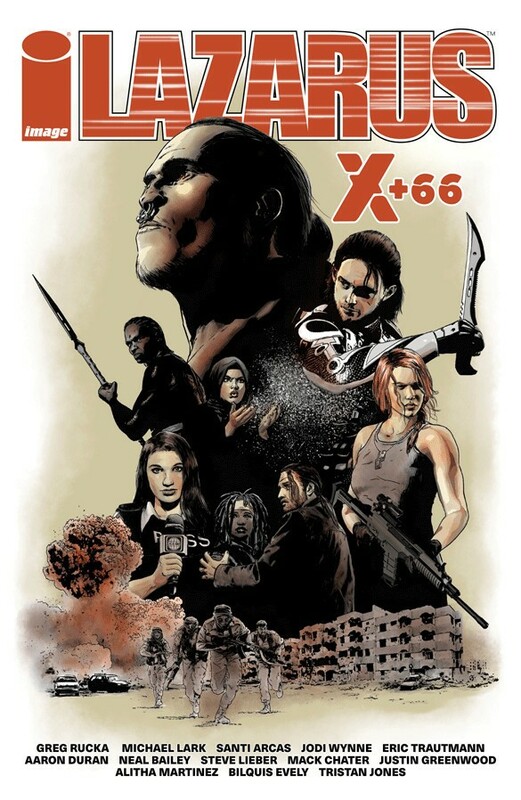 With minimal spoilers and maximal teasers, we’ve offered an introduction to the story arcs that weave through the 28 issues of Lazarus, as well as the Lazarus: X+66 miniseries. These comics are an open invitation to immerse yourself in one of the most well-told stories in comics, delivering a merciless commentary on the perils of absolute capitalism and social dissonance. Lazarus is comics as prophecy. The oppressively wealthy Families of Lazarus constitute the foundation of Rucka and Lark’s dystopian world. These hyper-rich tribes have replaced governments, each clan employing a Lazarus who is also a member of that Family… sort of. The series' hero is Forever Carlyle, an artificially created super soldier of the Carlyle Family. The Lazarus is more of a walking kill squad/security system grown and drugged for absolute loyalty—and able to die and resurrect repeatedly for more carnage. Throughout the series, Forever serves as a pawn of these warring Families, her faithfulness exploited by the Carlyles, eliciting endless sympathy from the reader. The first arc also launches a score of subplots and describes a cynical society built on segregation: the infrastructure of Lazarus divides its population into Families (the ruling class), Serfs (people who serve the Families directly), and Waste (the impoverished working class). By the end of the arc, Forever becomes aware of where she fits in the food chain, the creative team setting the table for escalating interfamily (and intrafamily) conflict—along with the possibility of romance with the Morray Family Lazarus, Joaquim Morray. 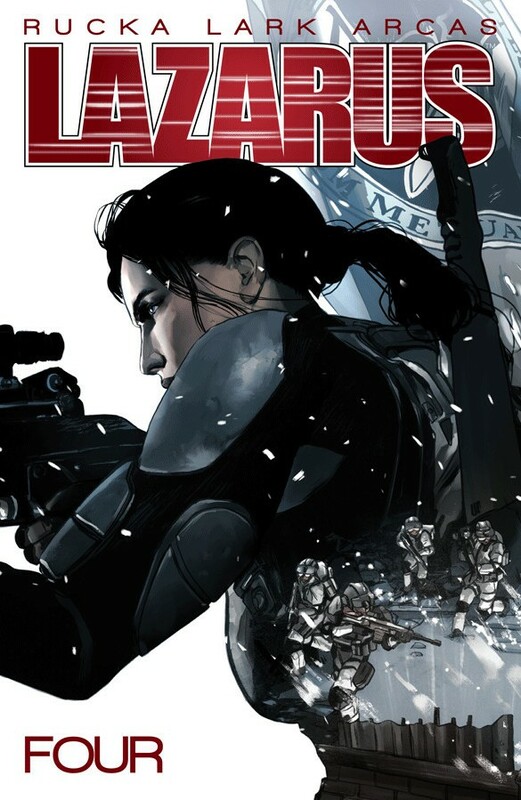 In Lazarus’ sophomore arc, the plot thickens on several fronts, diving into the flashbacks of a young Forever as she trains with her tutor, Marisol. These sessions—including sporadic visits by her absent father—provide a closer look at how Forever’s Family manipulates her emotionally. The other major event introduces the Lifts: an “opportunity” for Waste to be “lifted” into Serfdom for a Family if they’re hardy enough to make the cross-country trek and lucky enough to possess the needed skills. The Waste also can’t have any genetic markers for disease, either. There’s never been a better comic about class friction. Before kicking off this story arc, a one-shot features the fate of Forever’s sneaky brother, Jonah. The devious character becomes more sympathetic after he suffers humiliation at the hands of the rival Hock Family, which treats him even worse than Waste. When he whines “I’m Jonah Carlyle!” on deaf ears, his privilege and entitlement fail to yield any relief. In the main arc, the Carlyle and Hock Families try to resolve their differences via a conclave, or private negotiation, all the while scheming behind the scenes. Forever and Joaquim’s forbidden romance also evolves at a slow, seductive burn. This arc ends in an epic Lazarus fight, but the highlight is a game of Lazarus-only poker. The camaraderie between the Lazari is touching and logical. These artificial, but sympathetic, killing machines relate to no one but each other. 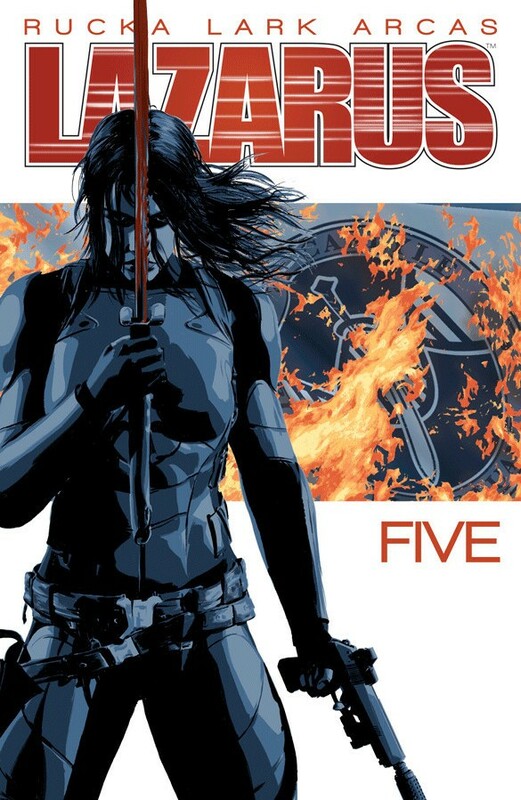 In the fourth volume, Lazarus segues into a war comic, and what a war comic it is. Lark’s chiseled documentary style is perfect, making this the rare action comic that doesn’t glorify violence. The bloodshed—such as Forever sneaking up behind the Hock Family’s medicated troops and beheading or stabbing them in the head—is quick and brutal, honest and unsensational. Thanks to Lark’s visuals and Rucka’s restraint, Lazarus is the ultimate show-don’t-tell comic. One of the most potent images of the Battle of Duluth is a panel that spills pills and blood in the snow. The reader also sees former Waste characters who were “lifted” in the second arc taking their places in the rigid world of the Carlyle Family. One character, Michael, becomes a “doctor” without any formal training: that’s the power of being favored by the powerful, especially when they’re desperate. Meanwhile, another subplot features Casey Solomon, a corporal on the frontlines of the war. Even with Forever by her side, survival is a challenge. Some revelations about Forever would be criminal to spoil, but Rucka and Lark are patient, building to a shocking development foreshadowed all along. The war continues, though Forever is missing a limb. That’s easily fixed, but the Family can’t agree on how honest to be with their increasingly rebellious and self-aware bodyguard. There’s no textbook for when to tell your sister-assassin she was born in a vat of robot soup and will be replaced someday—possibly soon. 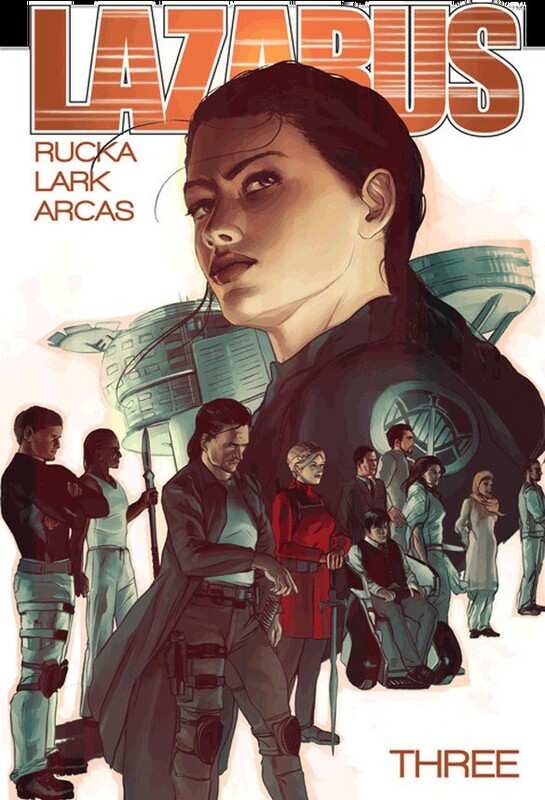 In the finale, Rucka and Lark find new ways to heighten the themes of the series while putting poor Forever through the wringer, causing hundreds of readers to yearn for a Lazari-led revolution, leading the Waste and Serfs in an all-out war on the Families. In this miniseries, Rucka pens a collection of six one-shots co-written with Aaron Duran, Neal Bailey, and Eric Trautmann and featuring art by Mack Chater, Justin Greenwood, Bilquis Evely, Tristan Jones, Steve Lieber, and Alitha Martinez. These vignettes add great texture to what is already the most carefully constructed world in comics. (For more background, read the Lazarus Sourcebooks, which provide a mind-breaking level of detail and history on each Family). These stories feature Casey’s Dagger training (the equivalent of becoming a U.S. Navy SEAL); Joaquim’s relationship with his Family, Michael and Casey’s parents' difficult transition from Waste to Serf; tales diving into the histories of two peripheral Lazari; the trials of journalist Seré Cooper; and the monstrous Lazarus called the Zmey.